Before you tackle your mile-long gift list, make sure your holiday cards are signed, sealed, and delivered on time! Holiday card etiquette can be tricky, so follow our tips to ensure your season’s greetings go off without a hitch. 1. Pick the perfect photo. Picking the photo can be the toughest part. Sort through family vacation photos, your favorite shot of your kids, or (if you’re a newlywed) use a wedding picture. If you don’t have one you love, call up your favorite local photographer and schedule a holiday shoot. Lots of portrait photographers anticipate the need for holiday card photos, so many offer “mini-sessions,” which are shorter and less expensive than their typical family sessions. We recommend planning a shoot in October so you give your photographer enough time to send you your edited images in time for card ordering. Although you’ll want to coordinate outfits, it’s not necessary to match perfectly! Think mixed patterns and complementing colors. Here are some ideas. 2. Pick your design and order! Now that you have your photos, it’s time for the fun part: designing your perfect holiday card. Select the design and sentiment that fits your family best and order your holiday cards before Thanksgiving to ensure you avoid rush shipping charges. Make sure you craft a thoughtful greeting full of holiday cheer to send to your loved ones. 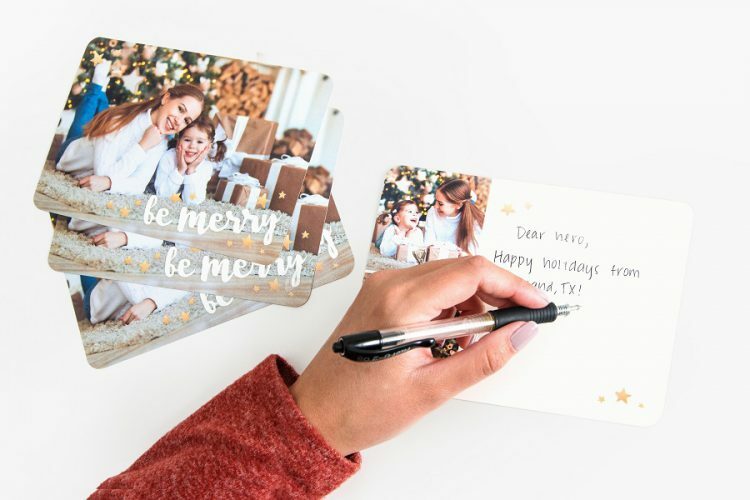 If you need some holiday card messaging inspiration, check out this post for ideas. 3. Decide who’s made the list. This is obviously a personal decision, but we suggest including family members, close friends, neighbors, business acquaintances (especially your best clients), and anyone who you think might appreciate the gesture. Cards that showcase an updated family photo are sure to put a smile on your recipients’ faces. Your cards have arrived (yay)! Now it is time to address them, add proper postage, and make sure they are dropped in the mail roughly two weeks before Christmas. The postal service is slammed this time of year, and you want to make sure your cards are delivered in plenty of time. 5. Thank a hero this holiday season. This year, Nations Photo Lab is partnering with the National Military Family Association an organization that helps Military families endure stress and heartache most Americans will never have to understand. For nearly 50 years, the National Military Family Association has stood up for the families who stand behind the uniform through its programs and policy initiatives. Multiple deployments, constant moves to new duty stations, wounds, illnesses, and injuries all have a significant impact on military families. When a family is well supported, a service member is better able to focus on the mission ahead. With each Holiday Card purchase, we’re ensuring that military families are able to make every moment matter together. By donating a portion of sales, we’re helping to sustain projects as Spouses + Scholarships, Operation Purple Camp, Family Retreats and Buddy Camp. Do you like the tradition of sending holiday cards? Let us know when you will be sending yours! What’s your thought on writing a personal note on them? Love it – The more personal, the better.